This post is in collaboration with b-glowing. All opinions are my own. Post contains affiliate links. The eyeshadow palette market is so saturated right now, but when you find a palette like the new Illuminate +Shine from B-Glowing, it’s worth getting excited about. This new rule-breaking, Age Embracing™ eye and face palette is totally changing the game with its innovative ingredients, complementary colors that will brighten and flatter mature eyes all the way down to it’s chic and dusty rose zippered clutch packaging. 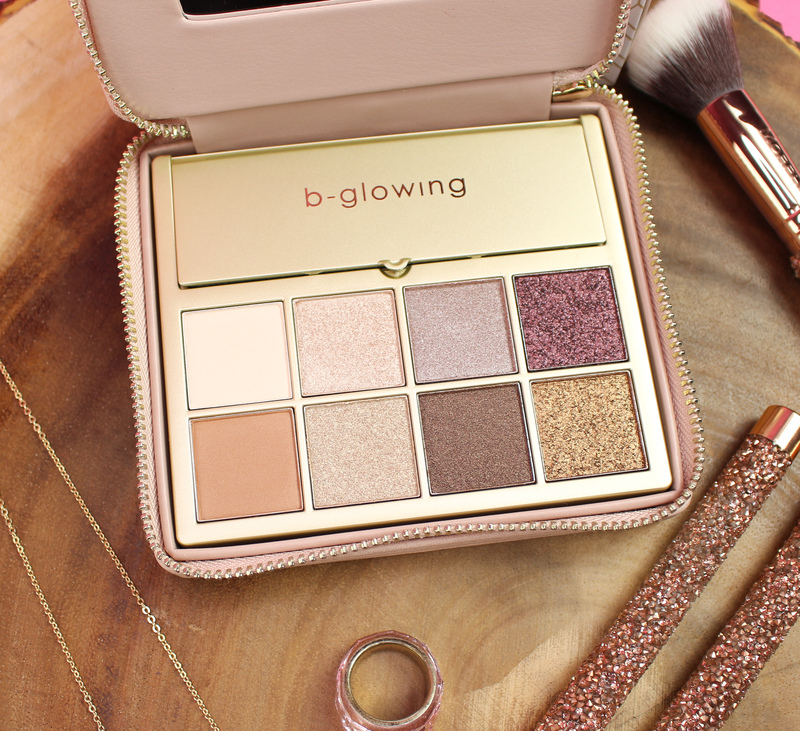 b-glowing definitely had mature skin in mind when they created this palette. No matter your age, skin tone, or personal style, they want you to shimmer, shine, and let yourself GLOW – as you should! When our skin matures, our makeup doesn’t perform like it used to! Gone are the days of boring neutrals, no color pay off, shimmer or bold shades. b-glowing is breaking all the rules with Illuminate +Shine and I am so here for it. 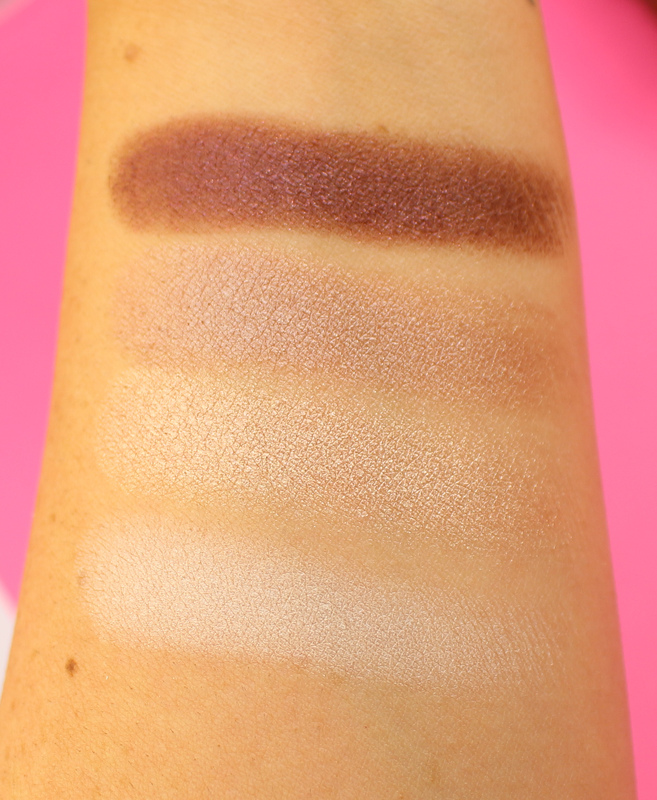 Filled with a brightening primer, cream highlighter, and eight pigment-packed shadows, you can expect this palette to brighten, blur, illuminate, smoothe fine lines, and nourish your skin. The formula in these products is incredible and they really thought them through by infusing the shadows with MicroVector Plump GABA-HYA—a moisture-rich blend of collagen, hyaluronic acid, and other ingredients that help to plump, hydrate and smooth the skin. Let’s talk about this packaging for a second – I freaking LOVE it. It’s the perfect travel palette and one I definitely plan on bringing with me to Vegas this week. My makeup is usually pretty minimal when I go (hello 115 degrees!) so I love that I can easily run Silhouette (matte brown) through my crease and top my lid with one of the incredibly gorgeous shimmer shades. Also, I can’t thank them enough for separating the cream products from the powder products with the lift up compartment. I despise when they are placed next to each other with no separation. Thanks to the zippered case, it will keep the shadows secure and eliminate mess. You can also pop this palette out when you’re done with it and reuse the zippered clutch. It’s going to be perfect for holding jewelry or any other trinkets you have. The eye primer is the perfect shade for my lid. Not only is it a universally-flattering primer to create a smooth canvas for makeup application, but it also helps to reduce the look of fine lines and pores. I’ve also been using it as a concealer under my eyes or to conceal any blemishes I may have. 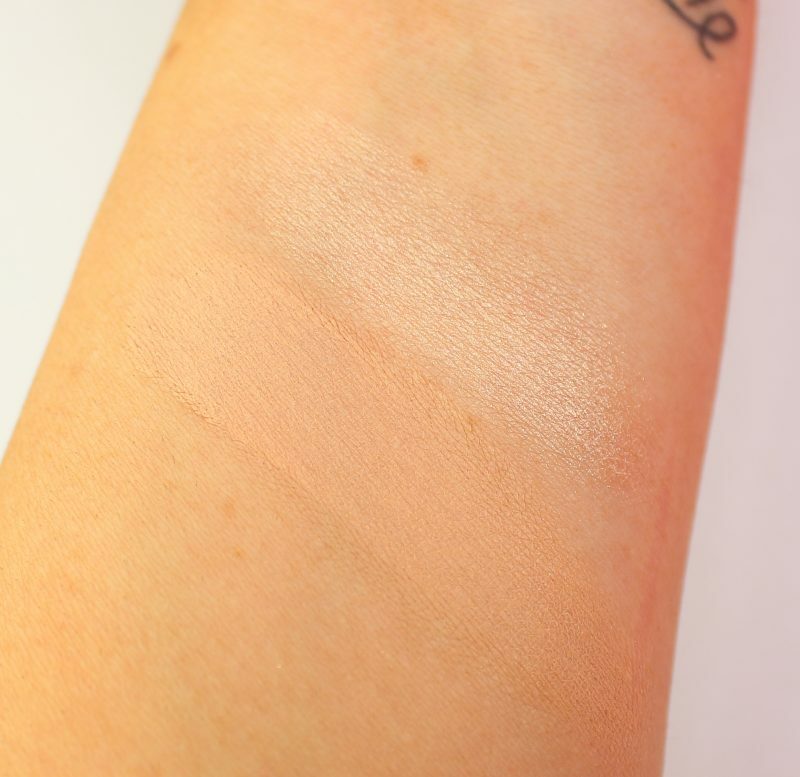 Onto the highlighter – it is a cream highlight which normally isn’t my favorite, but if you like a subtle lit from within glow, you will love the way this looks. I’m more of a blinding kind of girl, but nonetheless, it’s creamy and looks very natural on the skin. The pigment-rich shadows each represents a different colorway, or “look”. These shades can be worn alone, mixed together or layered to create an effect all your own. You can even use the darker shades as an eyeliner! I had no issues blending or creating a look with these. The formula is so silky and velvety-smooth that they just melted right into the skin. 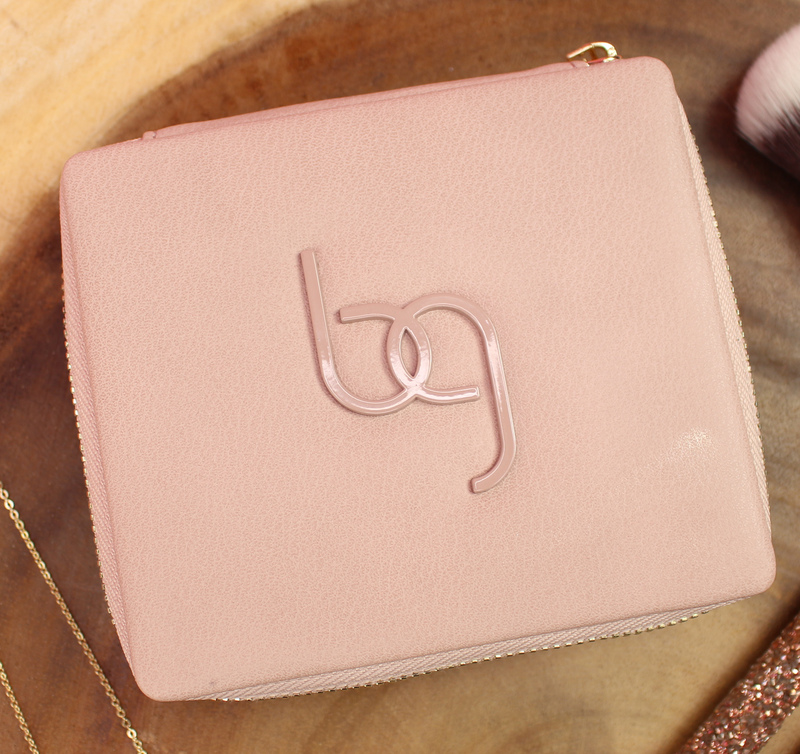 If you travel frequently like I do, it’s compact enough to fit in your makeup bag so you can touch up anytime, anywhere. Is this palette worth $48? My answer would have to be YES! The value is absolutely incredible for what you are receiving on top of high-quality shadows, great formulation, and a sturdy, reusable makeup case. It would make an amazing gift for someone you know – especially if they have mature skin and are looking for that perfect makeup palette that lets them glow from within. What are your thoughts on this palette? Does it sound like something you would use? I love the colors in their palette. That gold shadow is calling my name! Also love your nail color-it’s so pretty!! Love love love this palette and those brushes!!!! Such a beautiful palette! I bet you must have a gorgeous glow when you use it! This is just such a pretty palette! These are colors that I would wear all of the time! oooh I love all of the metallic colors in this palette! Would be awesome for the fall! The palette is right up my alley, and those brushes – wow! OMG!! Those colors are life and the brushes are too cute. I like that its travel size and you can carry it as a little wallet. Cute and clever idea. I saw this on Prime Beauty’s blog and fell for it and now you’ve reminded me of the beauty of this. I want!! Can’t wait to see you this weekend! This is definitely a pretty palette and I love the zippered pouch for sure! I have this palette and absolutely adore it. The quality is fantastic and the leather pouch is so elegant! Oh my word! This is a gorgeous palette! NEED! I love the skincare ingredients in this palette. 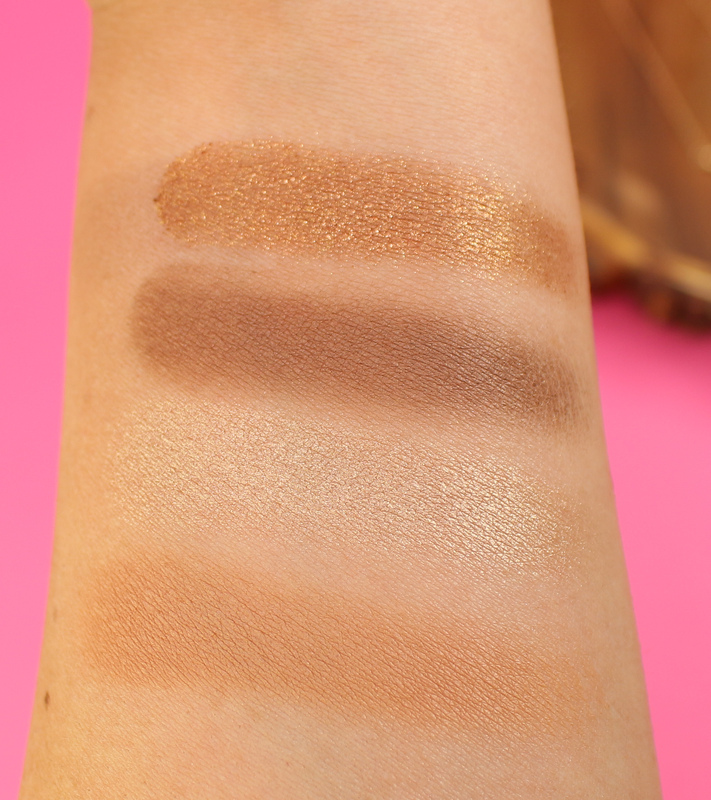 The shades in the swatches look like they’re subtle and perfect for everyday. And the packaging is brilliant! Oh my gosh the packaging is so pretty! I love anything gold, pink and sparkly! 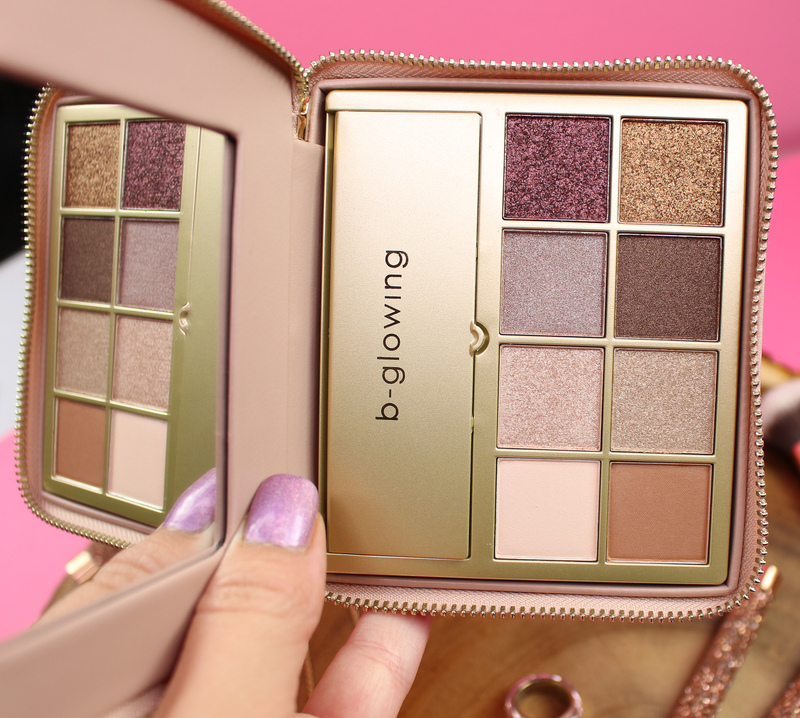 What a great palette, and how pretty is this packaging! I’ve had more than a few cream products ruined by being so close to powder ones, so I greatly appreciate this attention to detail! Wow there are super gorgeous shimmers in this palette! What a pretty eye-shadow palette, I love all these warmer and highlight colors! It’s perfect for Vegas! That is a very cute palette, and I love that it has a zipper! Such a pretty palette!! Love those sparkly brushes too! So pretty and the packaging it lovely! 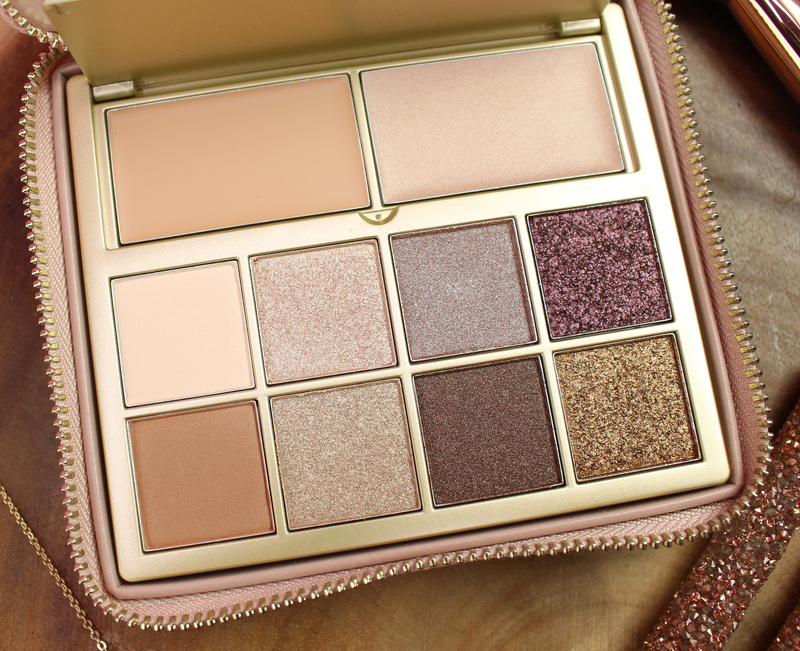 Such a pretty, travel-friendly palette! 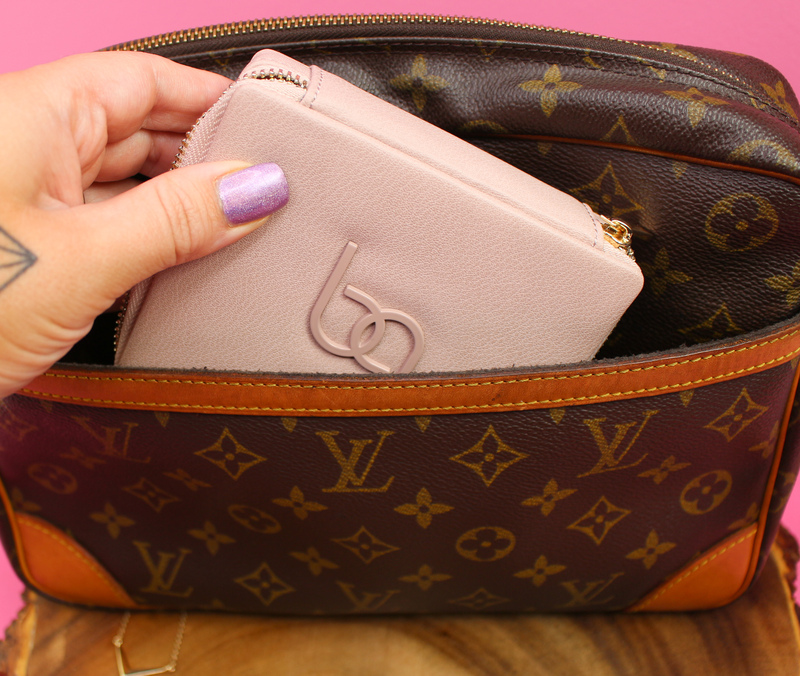 I like how it zips open — if it makes a mess in your bag, it’s contained! And those brushes, wow! Love how sparkly the brushes are! So pretty! This is so perfect for travel! And the colors re absolutely gorgeous! This is a great collection of colors and that packaging is so cute. 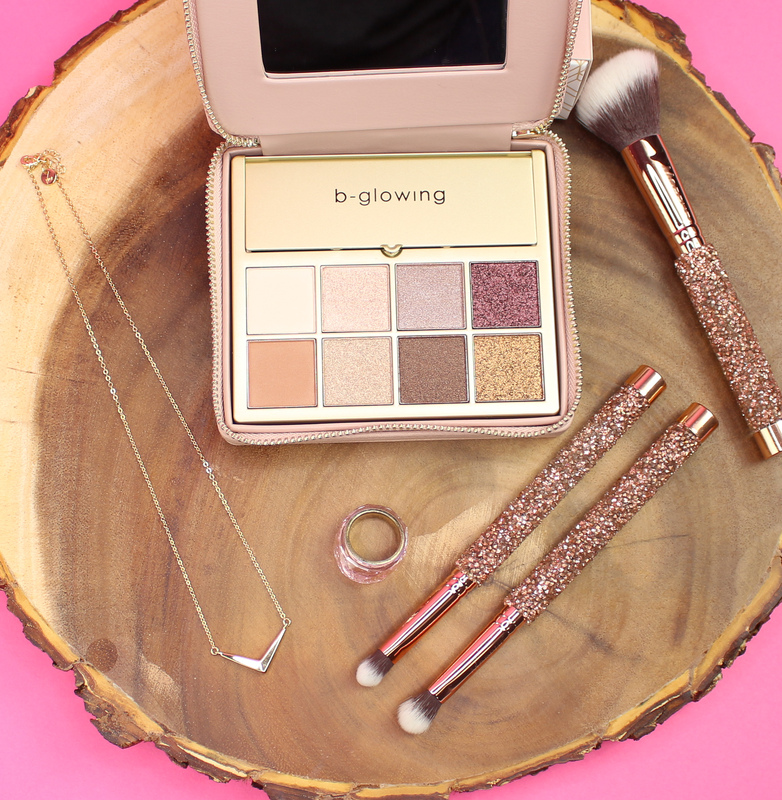 B-Glowing beauty products are quite pretty! I always choose beauty items in this store by clasping coupons from dealhack.